LOS ANGELES, CA (Sept. 7, 2017) – Twentieth Century Fox Home Entertainment presents WAR FOR THE PLANET OF THE APES. Certified Fresh on RottenTomatoes.com and “one of the very best films of the year” (Kristopher Tapley, Variety) arrives on Digital October 10 and on Blu-ray™, 4K Ultra HD™ and DVD October 24. 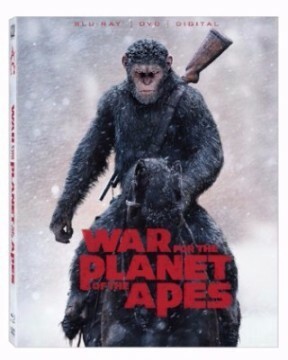 Andy Serkis returns as Caesar in the thrilling and climatic chapter of the PLANET OF THE APES saga as Caesar and his apes are forced into a deadly conflict with an army of humans led by a ruthless Colonel (Woody Harrelson). After suffering unimaginable losses, Caesar resolves to avenge his kind, pitting him against the Colonel for a final showdown that will determine the future of the planet! Special features include exclusive deleted scenes with optional audio commentary by director Matt Reeves, behind-the-scenes featurettes, including “All About Caesar,” which focuses on Andy Serkis and his incredible performances through the three films as Caesar, bringing his character and his journey to life. Additionally, the digital version of the film includes 10 Scene Comparisons, showing a side-by-side exploration of the actors’ performance captures above the final scenes in the film. WAR FOR THE PLANET OF THE APES is directed by Matt Reeves with Peter Chernin, Dylan Clark, Rick Jaffa and Amanda Silver serving as producers. Scene Comparisons (10 Scenes) – Side-by-side comparison showing performance capture above the final scene.